Businesses are constantly at risk for online attacks as hackers continue to develop more sophisticated methods to breach security protections and inflict damage on a business or its customers. Enterprises can use SSL to protect their online presence, which rely on encryption based on the RSA algorithm. While these keys remain secure, increasing threats require additional strengthening of online encryption. Due to these threats, Symantec has introduced algorithm agility as part of its SSL certification process. Businesses now have the ability to choose between three algorithms to provide protection, or to generate certificates for all three to install on a server. This flexibility allows business owners to provide a broader array of encryption options for different circumstances, infrastructure and customer or partner groups. 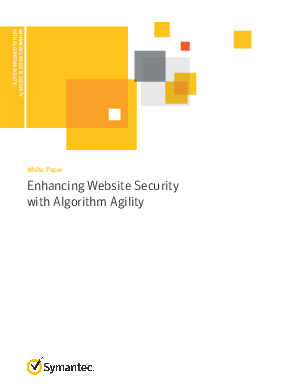 Read this whitepaper to learn more about algorithm agility, how it fits into the current and evolving security landscape and how your business can enhance online security through a more flexible, scalable approach to SSL certification.